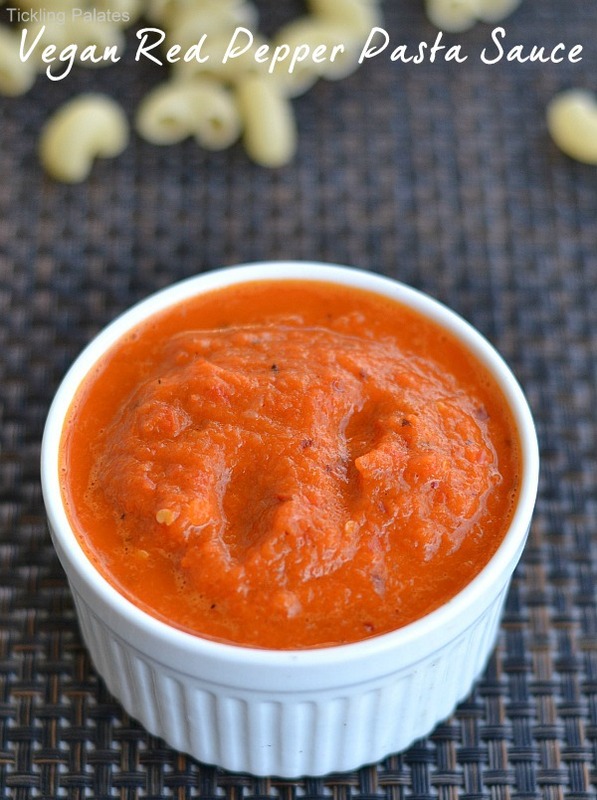 Vegan roasted red bell pepper sauce Recipe. 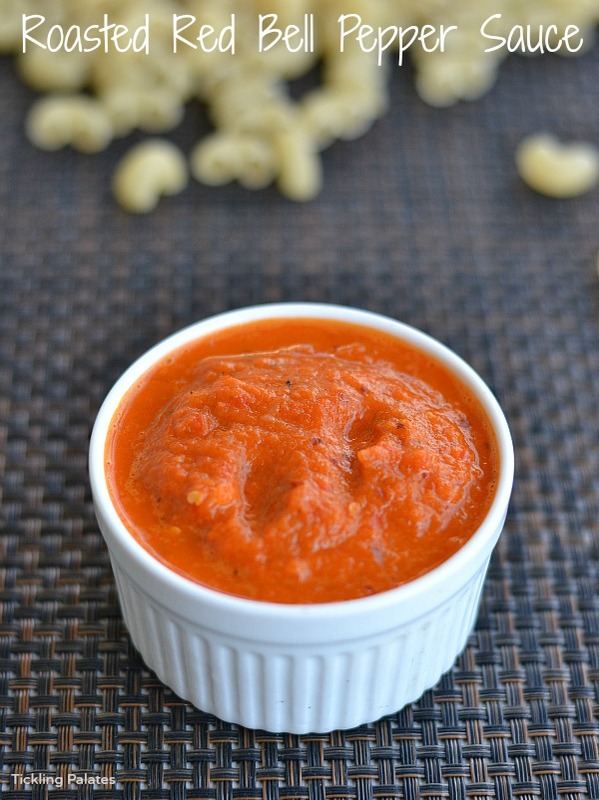 This homemade pasta sauce using roasted red bell pepper is simply the best. It’s so creamy and tangy and tasted absolutely yummy when I served it over pasta. This is the first time I’m trying out a pasta sauce using Red Bell Pepper (Red Capsicum) and totally loved it. And guess what this pasta sauce keeps well in the fridge for a week. You can rustle up pasta either for your kids lunch box or for a quick fuss free dinner in no time at all if you have this handy sauce stored in the fridge. My kids have always preferred noodles over pasta and have a set mindset that colored peppers are to be eaten only with stir fried rice or noodles. May be that is the reason for my lack of enthusiasm. I’m sure there are several ways of making this sauce but here is my version of making this easy pasta sauce at home with simple ingredients that are already available in your pantry. This is a very flexible sauce and you can serve it mixed with pasta, Couscous and you can also use it to spread on pizzas and breads as a sandwich spread. These are just a few ideas on how you can use up the sauce. If you do not have Italian herbs at hand, use fresh coriander leaves or basil leaves while sautéing the vegetables. 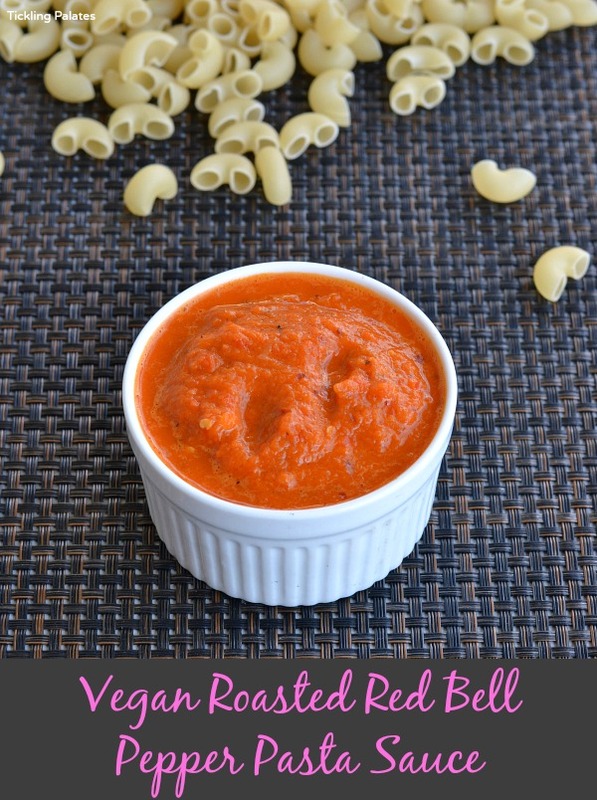 Check out this Vegan Roasted Red Bell Pepper Pasta that I rustled up using this sauce. You can also use this Basil Flax Seed Pesto and Marinara Sauce to make a quick pasta dinner for the family. Vegan roasted red bell pepper sauce recipe that can be made under 15 mins and stored for a week. Chop onion, tomato and red bell pepper into big chunks. Heat a pan with 3 tsp oil. Add whole dry chilies and sauté for a few seconds. Add the chopped onion, garlic pods, tomato, red bell pepper and sauté till the veggies get roasted well and shrink in size. Take off fire and let it cool completely. Transfer the roasted veggies to a mixer jar or food processor and grind to a smooth paste using 2 to 3 tsp water. Heat the same pan with remaining 1 tsp oil. Add the ground paste, mixed dry herbs, salt and mix well. Cook for 1 minute over medium flame till the sauce thickens and take off fire. You can either use the sauce immediately or let it cool completely and transfer to a jar before refrigerating. Use the refrigerated sauce within a week. Like this cool and refreshing. That recipe is definitely a good I will be making them! Everybody loves discover delicious new recipes, and an occasion this is a perfect opportunity to do so. Delicious and colourful looking red bell paper sauce. Looks delicious! I need a change from the usualy onion tomato sauce bases I’ve been trying lately! Bell peppers are sure to add a kick to the traditional sauces! I love red bell pepper- the sweetness with a hint of tang takes any dish to a new level. The sauce looks absolutely fabulous. I m sure both the boys must have had a ball! Wow… A great twist to an arabitta sauce.. I m returning to blogging after a break. Please do visit my space when time permits. Love this flavourful sauce, can have simply with pastas topped with cheese. Very elegant and great clicks.. thanks for sharing!